Ivan Lins is a musician, composer and singer. 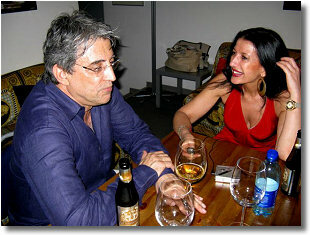 For over thirty years he has written and performed Brazilian Popular music (Musica Popular Brasileira) and jazz. His first song, Madalena, has been recorded by Elis Regina in 1970, but became more popular in the version sung by Simone Bittencourt de Oliviera. Lately Lins wrote the song "Wonderful Tonight" with Michael Bublé. Ivan Lins collaborated with a vast number of artists during his career as a composer. His songs have been sung and recorded by famous artists and vocalists all around the world. 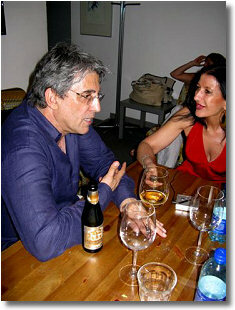 I meet Ivan Lins in the backstage of the Blue Note in Milan, after the second set of his concert. He welcomes me with a smile, and we start the interview. The whole World already asked you all sorts of questions, but I would like to ask you something really specific. What do you feel when somebody else is singing the songs you wrote? And what is the kind of emotion that comes to you, honestly? It's like…. It's a gift. Because this is why I write songs. When I start to write songs, well, I've never written songs for me, because I started to sing a little late in my career. Well, I started everything late. I started piano when I was 18, and then I started to write songs when I was at the University, and I never thought I was going to sing one day in my life. So when I was starting to write songs, I was imagining somebody singing them. And this kicks into my heart today. Now your songs are sung by vocalists all around the World. This is a gift for me. This is really why I write songs. More than for myself. But do you ever get the feeling that the song sounds new to you through another singer's interpretation or different arrangements? Yes, sometimes. But this is what the song is for. To be imagined by who is going to record or sing the song. It's the same when I sing a song by another composer. Each one person has something different to give. It's all about feeling, personality, and so on. It's beautiful when you find out somebody who goes in your same direction, and performs the song with the same feeling as it was written. That's what the singer has to do, and usually the good singers do it. Wonderful singers sang your songs. Is there somebody who hasn't sung your songs yet that you would absolutely love to listen interpreting your songs? Oh yes! In Brazil Maria Betania…. She never sang my songs, but no problem…. That's one example. And outside, Milton Nascimiento, Gilberto Gil, Caetano Veloso, Edu Lobo. And outside Brazil all these great artists: Dulce Pontes in Portugal, Laura Pausini, Fiorella Mannoia in Italy, there are so many! Sting, Peter Gabriel, Paul Mccartney…Well, why not? Beyoncé, Christina Aguilera. She really has a beautiful voice and is a great singer. Is there something you had in mind to do but you have never done? Something that you would love to do in the future years? Oh dear! Hmmm….I have so many ideas. I have so many projects! You know, I have a book, a pad, with my ideas and projects, but I don't have enough time do all of them. And I don't know if I'm going to have time to do all of them. I would like to make a very good work with the fados from Portugal, you know? And I would like to do an album with Italian artists, I would really love to do this. I would like to do a project, and this may happen - of mainstream jazz - you know, I started this project – but I interrupted it because there was no time…. But there's a project on Brazilian country music in a duo. I have a duo. I would like to record something with this duo because I used to do charity fund-raising concerts with the duo, and we did a lot of these concerts. We used our middle names Gimarais – Fioravanti, and nobody knows. Only the people who went to these charity fund raising shows know. Recently, last year, I went to a TV show and I decided to introduce the other guy, and people really fell in love with that, and I'm probably going to do this too. I have three projects on the road. One is beyond release now, and that is with the Metropole Orchestra, I recorded live last year with Mendoza conducting and arranging. The other one is the Big Band project in Switzerland, the George Robert Big Band. We just finished recording and the record is going to be released in August 2009. The third one is a double CD in Spanish and Portuguese with guests such as Michael Bublé. Take 6 and Spanish guests too. I'm going to sing in Spanish and Portuguese, and there are going to be strings too. How many new tunes did you write for this album? Eighteen tunes. And this album is being recorded. We've finished the Big Band and we're still doing this double cd. And there's the mainstream jazz album…. Oh my dear, duo, maybe I'm going to do a project in trio, I don't know. And then there's the New York Voices project. The New York Voices? Wow. There's the Yellow Jackets project maybe for next year with Mendoza and Leo. We talked in Holland and we were thinking about next year maybe. Well, I don't know, I wonder what's going to happen in my life….. I think it's wonderful because you're like a volcano, so many things going on, so much creativity. It's a blessing because you keep on having new ideas. Some artists feel like they're in the middle of a desert at times. No ideas, no projects. But it's a true blessing when you're so prolific in ideas. One day I did a concert with Lucio Dalla in Sicily, Taormina, it was 3 years ago, and it was one of the most beautiful experiences I had in my life. In stage he is something… and I learned very much and my life changed, you know? I am what I am now because of Lucio Dalla. He's one of the persons that really changed my life. He's totally unpredictable on stage, and he does crazy things…. And I love to do crazy things because of him! He told me: "You can do crazy things, and that's it!" And so I do! He saved my life in a certain way because I've always been so shy…. And he said "If I can do it, you can do it!" You have no idea of what' I've done after that! This will last for years…. The freedom, it's freedom! I would like you very much to say this, because maybe he doesn't know. I've told him, but maybe he doesn't realize that he really changed my life. We did a song together, and I think it was released last year, with my music and his lyrics, and he sang it and it's beautiful. And this collaboration, I would love to extend. I would love to do more with him. I collaborated with Ivano Fossati too, I've recorded one of our songs but we have six more, and I would like to extend that too because I really love Italy and I have really good friends here, and artists that I really appreciate. There's a young artist that I truly love: Nicolò Fabi, and there's Stefano Di Battista, who introduced me to Vince Mendoza, and I did some concerts with him, and he introduced me to Lucio Dalla too! So Stefano Di Battista is very important for me too. Italy has much that attracts me, and I would like to continue these precious collaborations. The time for the interview is over, and Ivan Lins has to see other people before going to rest and leaving the next day. We thank him very much for his willingness to meet us, and we wish him to carry on all these creative and beautiful projects with artists from all around the world, and go on collaborating with our Italian artists too.